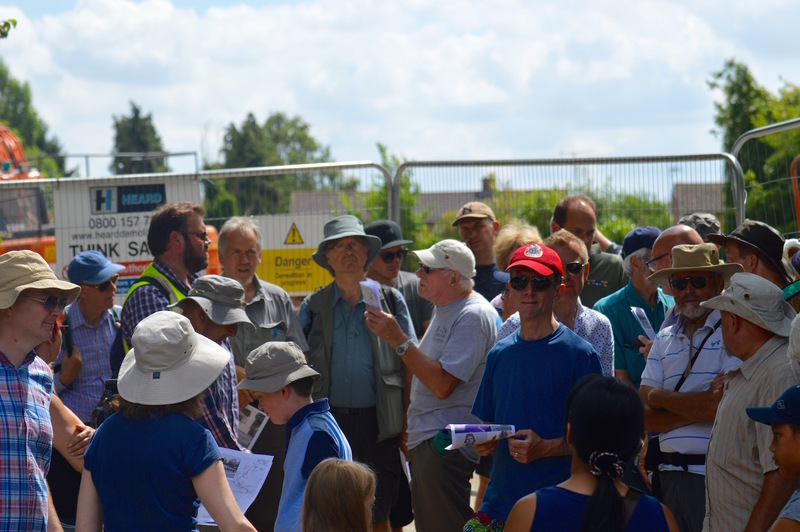 We were thrilled to welcome nearly eighty people to our airfield archaeology walk through history at Bottisham in Cambridgeshire on Sunday 24 July 2016. 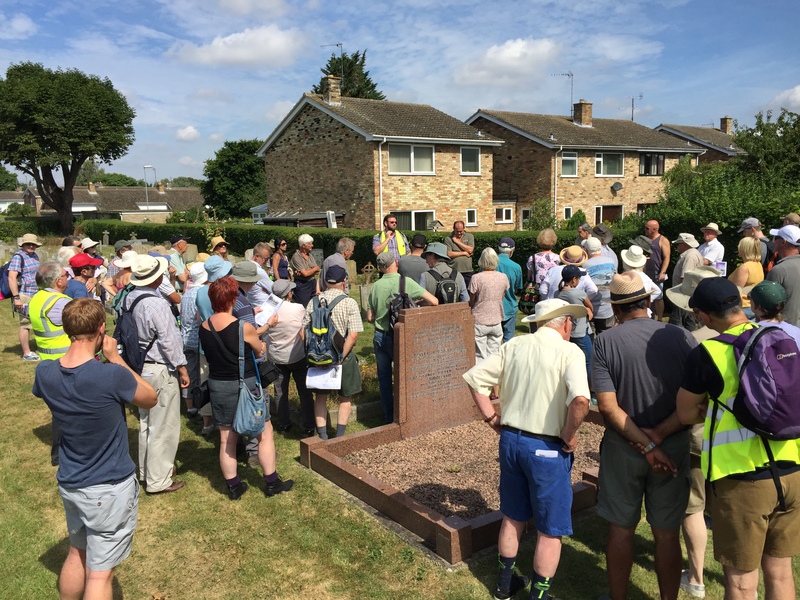 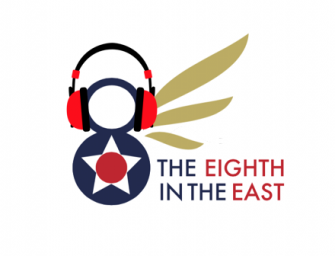 The walk was the latest in our series of walks through history on the historic sites of former 8th USAAF bases. 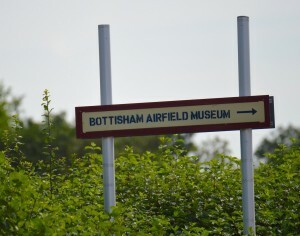 Bottisham was originally prepared in 1940 for the RAF – and was built as a grass airfield. 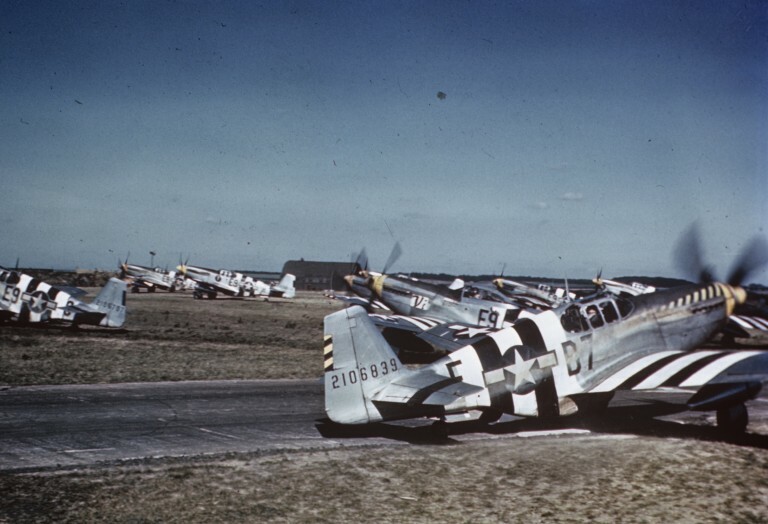 During the summer of 1943 the Air Ministry began work on enlarging the facilities in preparation for the arrival of new tenants: the 361st Fighter Group of the 8th USAAF. The Eighth in the East mascot awaits the first walkers. Looking out towards where the runway once lay. 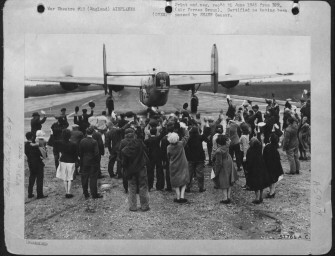 How the view looked on D day- 1944. 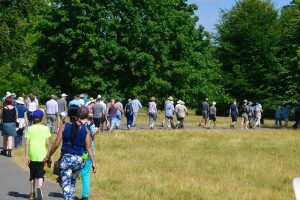 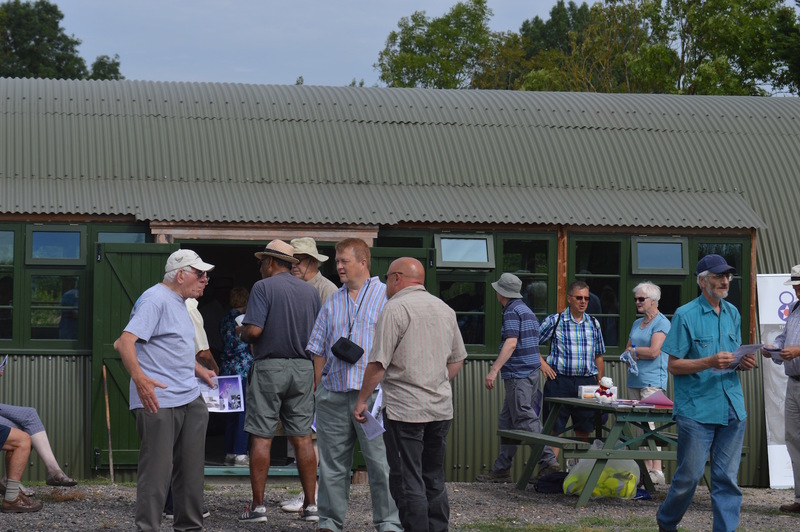 The walk began at the new home of the Bottisham Airfield Museum, where walkers were among the first to see the new Nissen Hut facilities, built entirely by volunteers over the winter of 2015/16. 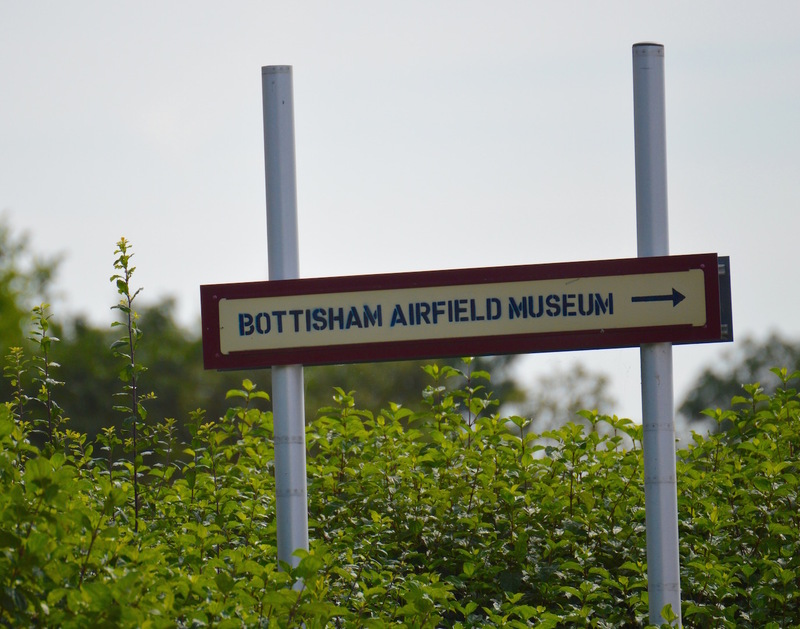 The museum will be fully open to visitors from September 2016. 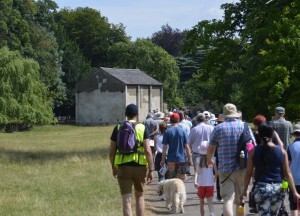 And don’t forget to look out for our extra special film about the building of the museum. 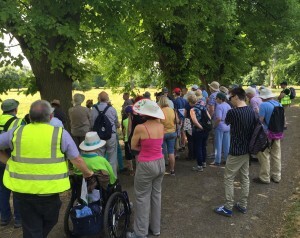 Walkers beside the former barrack base at Bottisham Hall. 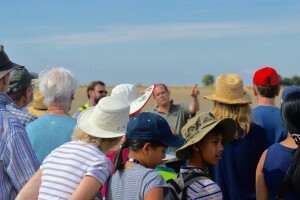 A walker listening to the archaeologist. 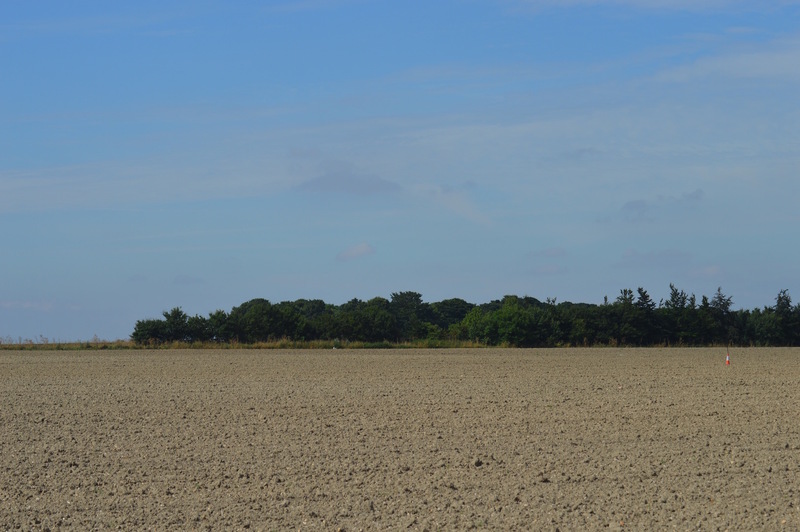 It was very evocative to stand beside the new museum and look out across the empty fields where once the runway ran. 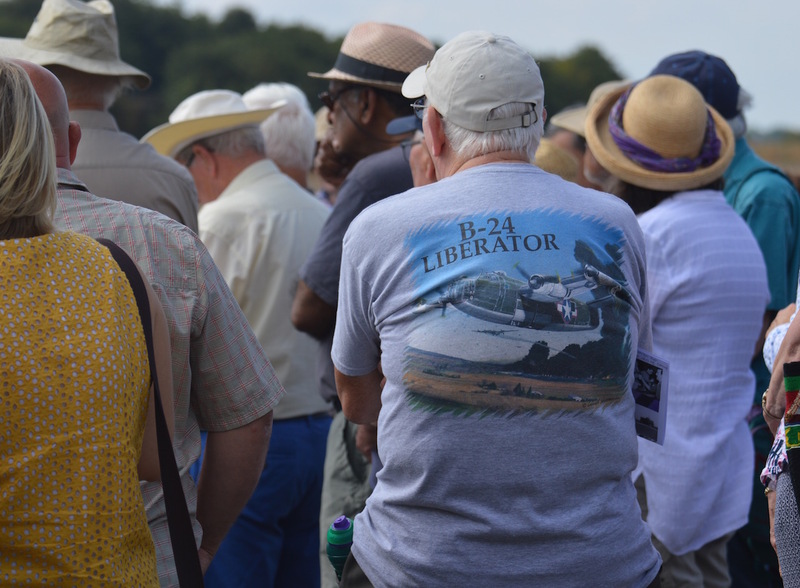 It was from here that the squadrons took off in support of the D-Day landings. 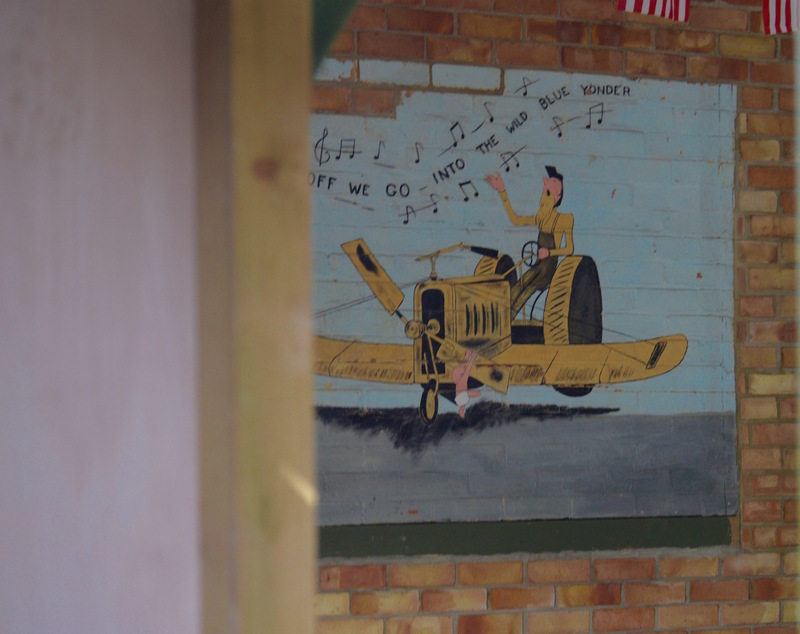 Along the route, we took in the 375th fighter squadron offices, pilot’s room and flight equipment store. 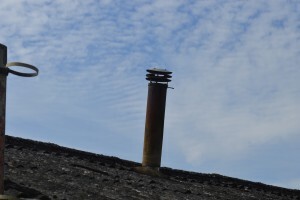 We also visited the former hospital building and sick quarters, found in a Tudor House & old School building. We time travelled past the 13th Century Trinity Church and visited the graveyard, with its memorials to the war dead. 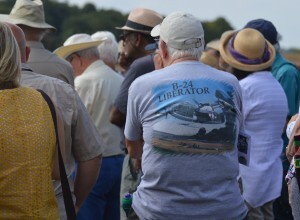 Next to the 375th Fighter Squadron site. Discussions at the recently demolished Site 4 of Bottisham Airfield. Refreshments back at the new Nissen Hut. 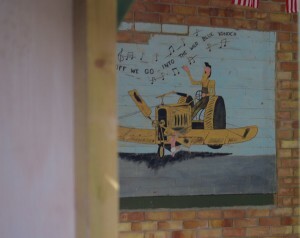 The mural restored to its home at Bottisham museum. 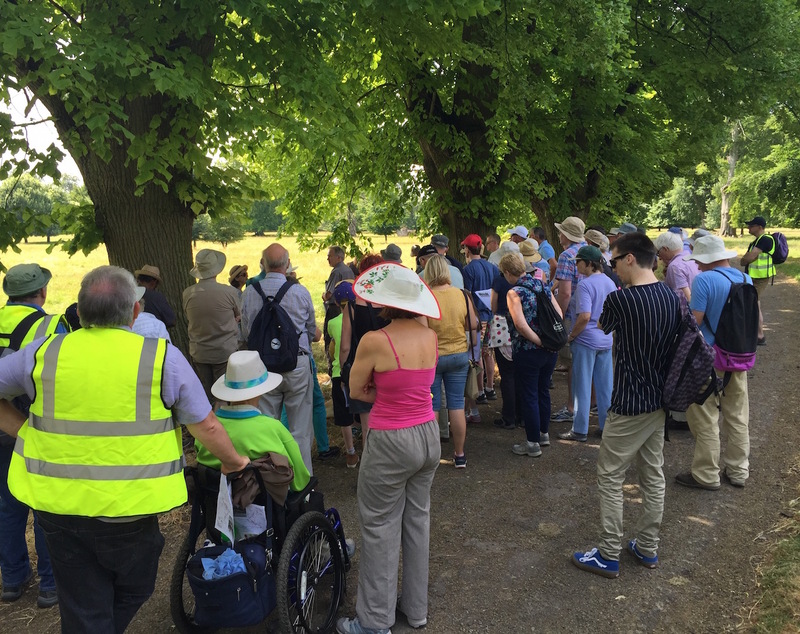 The walk also enabled us to visit the memorial to L/ Col Thomas Christian and also to enter the historic grounds of Bottisham Hall. 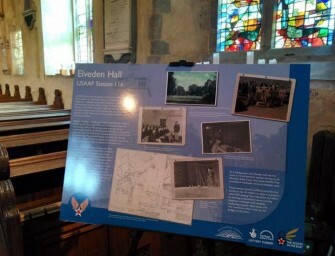 The hall was built in 1797 and was used as a billet for members of the 8th USAAF. 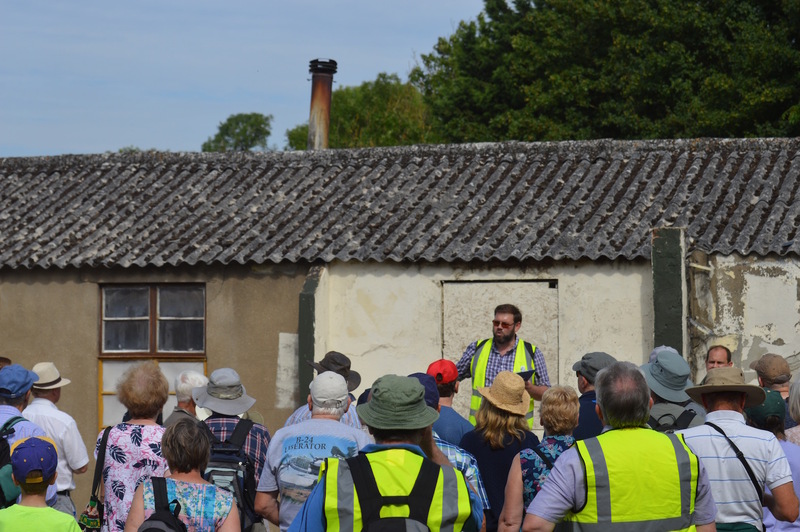 A number of troops were also housed throughout the Hall’s grounds in specially constructed huts. Today, the Squash Court remains as a sole reminder of the presence of the military during the 1940’s, many local residents told us this was the first time they had enter the Hall’s grounds. At the Trinity Church graveyard. 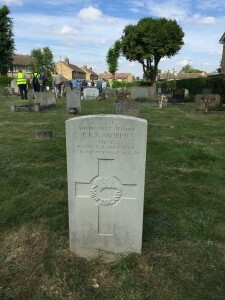 Remembering Pilot Officer R.K.A Andrew. 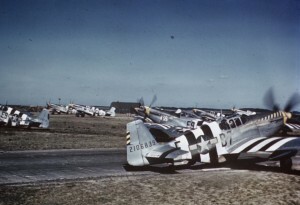 A building at the 375th Fighter Squadron. 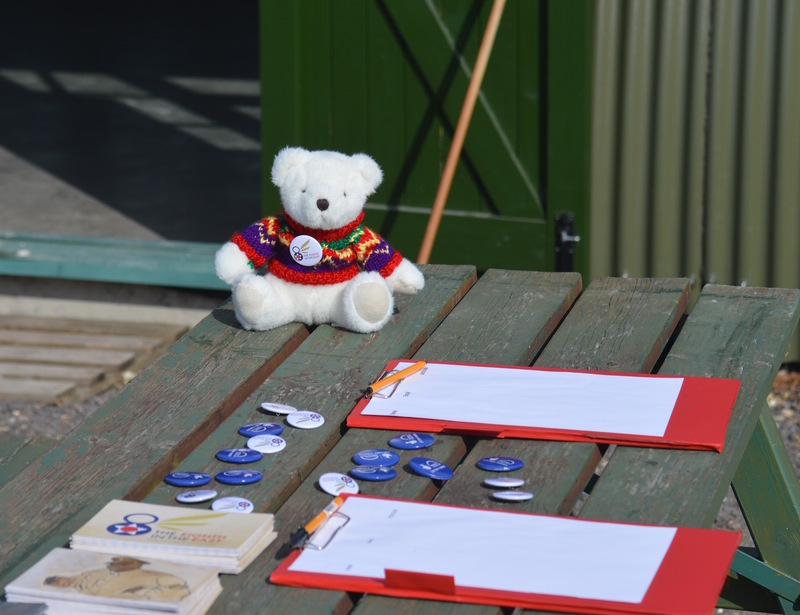 We’d like to thank all those who came along and made the day such a special occasion. Especially Jason Webb and his team of historians and volunteers at the Bottisham Museum, and our own Eighth in the East volunteers, who gave up their time to help steward the event and made the day possible for all. If you would like to find out more about our walks, or would like to stage one yourselves, then please drop us a line!